It’s spring again! The sun is out, the desert is in bloom, you’re feeling restless from being cooped up all winter, and some of the best holidays of the year are coming up fast – including Easter. You don’t have much time left to plan that party! Luckily, you don’t need much time – we here at Proficient Patios have got you covered with this handy collection of backyard Easter Party ideas. Let’s get started! Twist the theme. Bunnies and baby chicks are all well and good, but how much fun would it be to put a twist on the old theme? How about hiding buried treasure? Draw a treasure map that leads the kids to a succession of clues, have a contest to see who can do the best pirate impersonation and let your imagination run wild. Hide puzzle pieces instead of eggs. First, get a giant basket and fill it with enough Easter loot for the whole family. Then, stow it away in your most dastardly secret location. Grab some construction paper, write or draw that hiding place on it, then cut the paper into puzzle pieces and hide those around the backyard. Once the kids find every puzzle piece, they’ll be able to put them together and learn where you stashed the mother lode! Challenge mode. If you’ve got older children (twelve and up) who have recently become less enthusiastic about family activities, but you’re still nostalgic for the old, traditional Easter egg hunt, try putting things into Challenge Mode. Hold the hunt at night with glow-in-the-dark eggs, or if you have the time and inclination, hide eggs all over the city and send your family on a GPS Easter egg hunt! 2. Have an Easter craft party. If you’re not keen on the idea of filling your kids (or yourself) up with sugary candies, consider forgoing the Easter egg hunt and hosting a craft party instead. Adults and kids alike will enjoy crafting things like paper Easter baskets, spring-themed bookmarks, wearable bunny ears and much more. 3. Liven things up with Easter-themed activities. How about adding in some good old-fashioned play into the mix? Try an egg relay race, where you have to balance an egg on a spoon in your teeth and make it around the backyard without dropping it, or put a spin on the classic old Italian game and play egg Bocce Ball! Of course, you will want your backyard to be ready to entertain guests – the winter is over, and it’s time to start throwing parties, barbecues and more! 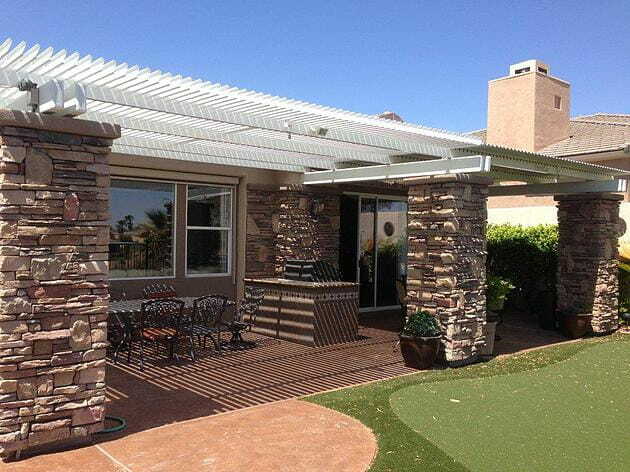 At Proficient Patios, we are happy to help you with all of your backyard and patio needs – we have one of the largest showrooms of patio furniture in Las Vegas, and we also proudly offer landscape and hardscape design, as well as fire and water elemental features.